Despite my mixed parentage (Irish/Sri Lankan) and English birth, I consider myself 100% Irish and growing up in Ireland I saw the racist face of some of the Irish at an early age. 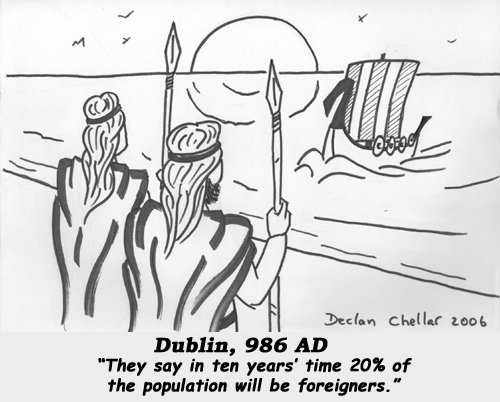 The Irish have always been considered hospitable and eager to welcome foreigners. However, I’ve long been of the opinion that this would be true as long as they were tourists, not staying and not plentiful. Now, it seems, I was right. According to recent research, 35% of foreign nationals have been racially harassed on the streets of Ireland. Black people in particular have suffered racial insults. In response, I would mention two names to any Irish people who participate in such behaviour: Phil Lynott and Paul McGrath. Here’s a further thought for you: there isn’t a single person living on the island of Ireland who is not descended from immigrants. Holy fuckballs, extraordinary to think that such creatures exist out there; I literally cannot remember the last time I met someone of that ilk. Thanks for your thoughts. I feel it is important to get various points of view.